After its wildly successful inaugural run, the Carnival Of Madness Tour returns this summer. 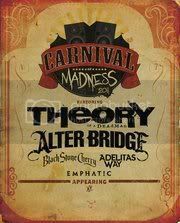 Joining the Carnival will be THEORY OF A DEADMAN, ALTER BRIDGE, BLACK STONE CHERRY, ADELITAS WAY and EMPHATIC. The Carnival Of Madness Tour will tear through North America for 25+ dates, set to launch August 13th in Twin Lakes, WI. VIP ticket pre-sales for the first 15 events will be available for those belonging to Theory of a Deadman’s Deadfan Club beginning Tuesday, May 31st, followed by those signed up for the Carnival Of Madness mailing list at CarnivalOfMadness.com, beginning Wednesday, June 1st. VIP bundles with exclusive merchandise, content, and an enhanced Carnival experience will be available for purchase through Artist Arena. The public on-sale for the first round of shows will be Friday, June 3rd. All of the ticket on-sale info can be found at CarnivalOfMadness.com. The “Carnival” ticket price acknowledges the current state of the economy offering an “affordable” ticket that will be in the $25 - $35 range.